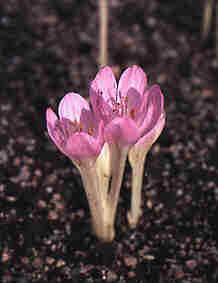 Autumn crocus received its name since the seed-pods appear in the spring, the leaves evolve in the summer and then finally a crocus-like flower blooms in the autumn. It is mainly a garden plant. Two to six hours after ingestion, a burning sensation is felt in the mouth, followed by strong thirst, irritation of the mucous membranes, stomach pains, colic and bloody faeces. The poison is called colchicine and is an alkaloid.